Should granite pavers be what you use to accent your yard, or are standard pavers the right choice for you? If you want a yard that is going to stand the test of time, plus look fabulous, you want to opt for granite pavers. They are a far superior product, and can be used in ways that standard pavers would not. When your goal is to make your backyard stand out, and look great for a long time, you definitely want to use granite. It is going to be the focal point of your yard, and spark a wide variety of conversations over the years. Granite is one of the strongest natural materials in the world. It comes out of the ground, so environmental changes don’t often affect it. Granite naturally comes in a wide range of colors, so you can either match your home, or you can find the perfect complement to your home. It all depends on if you want your granite pavers to match your existing structure, or stand out. Granite pavers also come in a wide variety of textures and patterns. You can opt to buy single pavers and make your own pattern, or you can buy tiles connected by a mesh to tile an area of your yard. Tiles can have a rugged finish to keep them from being slippery. They can also have a smooth surface, which protects them from damage and scratches. The options you have with granite pavers are only limited by your budget and imagination. When you opt to use granite pavers around your home, you aren’t just getting strength. On top of how strong granite naturally is, it is also very durable. It is difficult to damage, and under many applications, it is nearly impossible to even scratch. Granite has been used for thousands of years when it comes to building. If ancient Egyptians were able to build with it and get a result that is still standing today, your structure is bound to last the rest of your life and then some. When you want your backyard to stand out, using granite pavers gives you a wide array of options. Instead of simply using them as part of your walkway, consider alternative uses. Perhaps you can ring your pool with strong, durable pavers that can look great and withstand the water. You can even set up granite counters, tables, or a patio for poolside seating to make the entire area stand out. If you want to create a shaded area of your backyard, consider a terrace. You can have it set up off to the side with chairs beneath it. Since granite pavers do not mind getting wet, they make an ideal roofing material when they are used in special projects around your backyard. You can even mimic the look by having a patio beneath the terrace with the same color of granite pavers. This gives you a shady area to entertain, or simply to enjoy your own backyard. Do you like plants around your backyard? Then you may want to use granite pavers in a slightly different fashion. Consider creating a wall that has different levels where plants can be added, bringing color and function to a part of your yard that may have needed it. This wall can be near your garden, by a water element, or even standing alone for impact. It’s all up to you! Would you prefer to use granite pavers in the front of your home? There are options for you, too. You can do things like creating a stunning walkway to your front door. Driveways lined with pavers can make a stunning entrance to your home as people drive up. The pavers can also be piled up and create planters in different areas around your home. You can set them up to hold a specific size pot, and change out the pots and plants as the weather changes or you see fit. One of the biggest benefits of using granite pavers is the variety of options you have. Between the colors and textures of pavers on the market, you can make almost any design come alive. However, there are also a ton of different shapes available when it comes to pavers. You can design walkways or patios with options like a herringbone pattern, diamonds, or even geometric designs. When you want help designing a new feature with granite pavers for your yard, call in the professionals. They can buy the materials in bulk, which saves you money. Plus, they have the experience to be able to suggest things that will work in your space. Tell them what you envision, and let them come up with a plan to make it happen. Call in the experts at Granite Huggers, today! 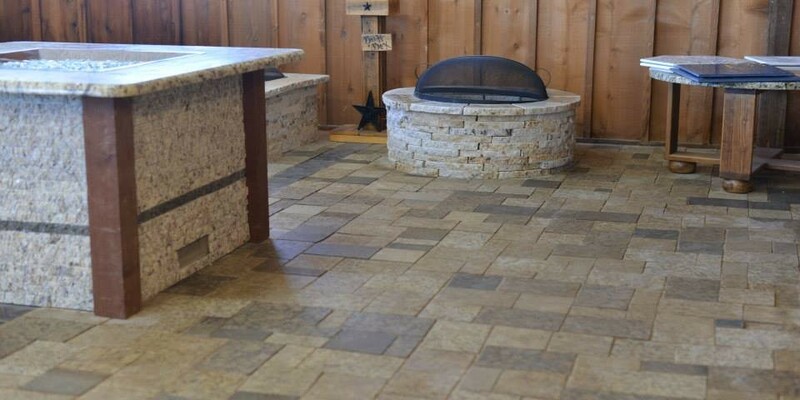 Give Granite Huggers a call today, at (972)670-4533, and find out what options they can help you with when it comes to designing with granite pavers in your yard!